In corporate programs and parties, DJ’s have become indispensable, considering the class of entertainment they provide. However, it is necessary to sign a written agreement between the two sides before the programs are finalized. 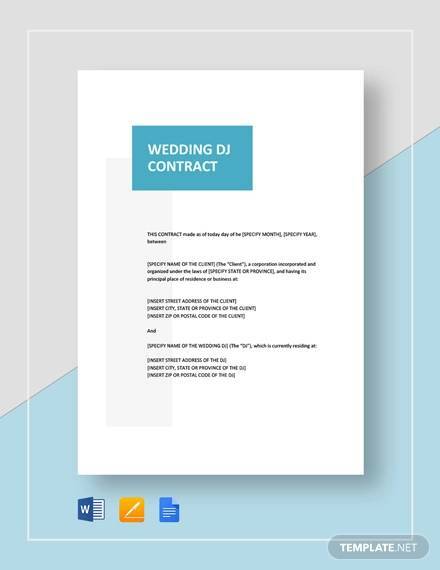 So, a DJ Contract lists all the specifications of the hiring party and is signed by the DJ’s to ensure that there are no hassles with the terms of the agreement in future. 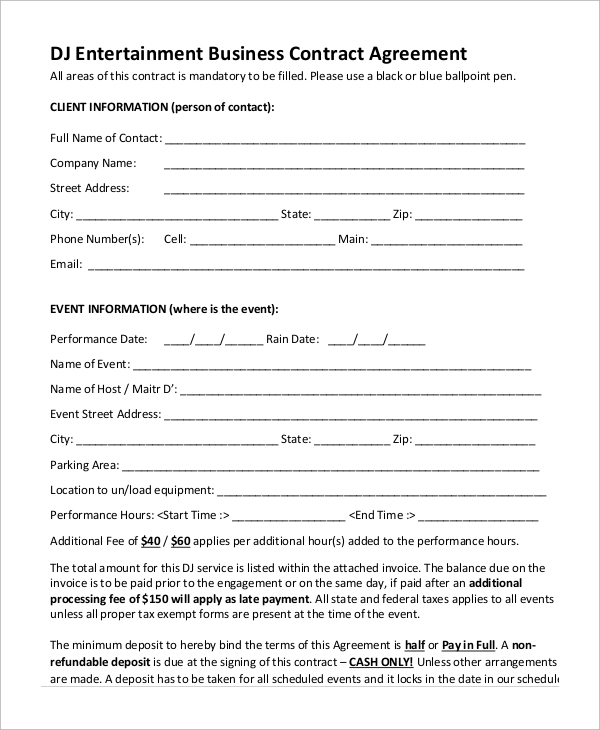 Check out these Sample Contracts to get an idea of what information is to be included in these forms. This template follows the basic format where the names of both the parties are specified at the top. Then the payment details and relevant information about the venue is included. 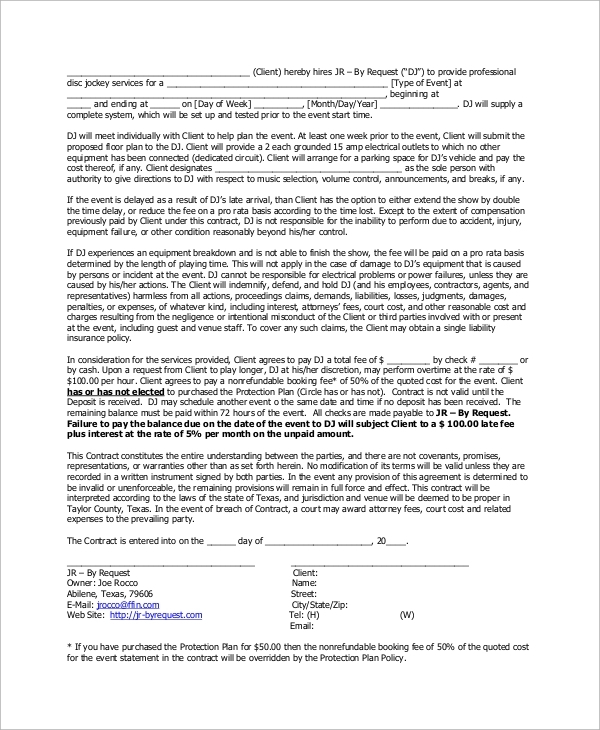 The special requests, terms, and conditions are included in the last section. 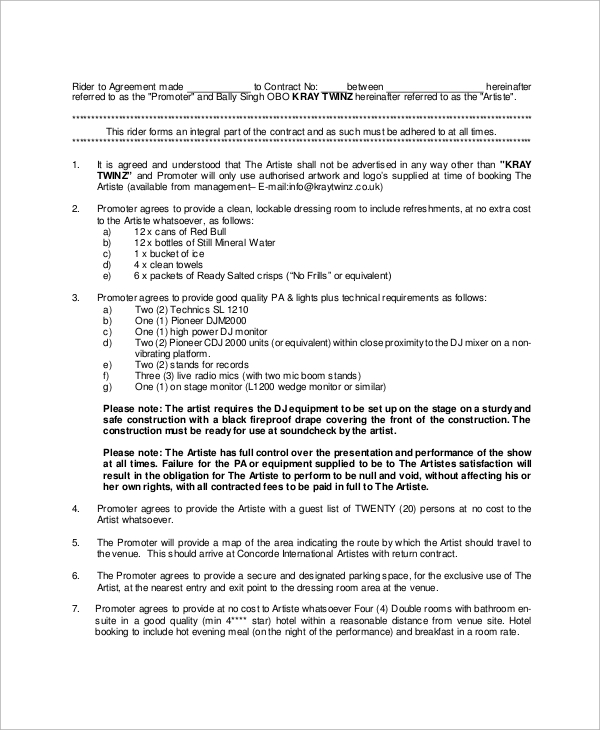 In this template, numbers are used to mark the different sections or paragraphs dealing with the details of the agreement. The terms and special provisions are listed up, with the signature in the end. 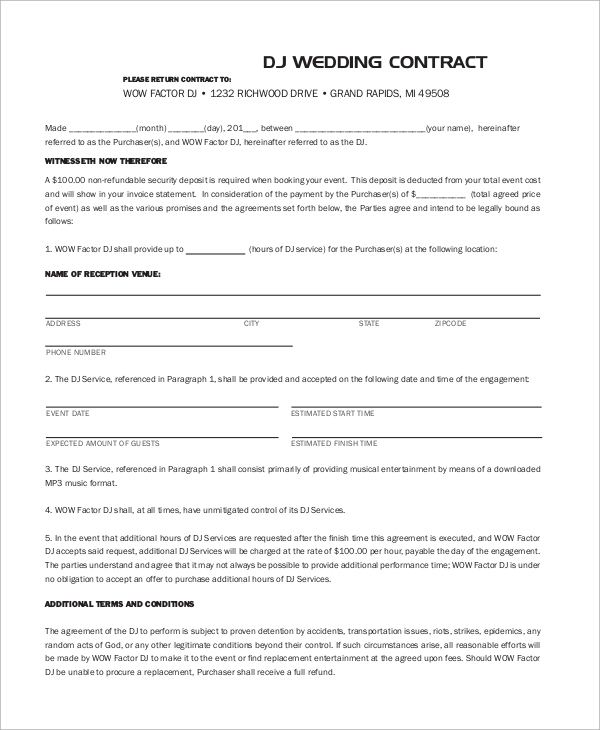 This is a simplified contract form where there are blanks alongside the statements of the agreements. They are numbered accordingly, and the blanks are filled up with relevant information. You can also see the Marriage Contract Samples. 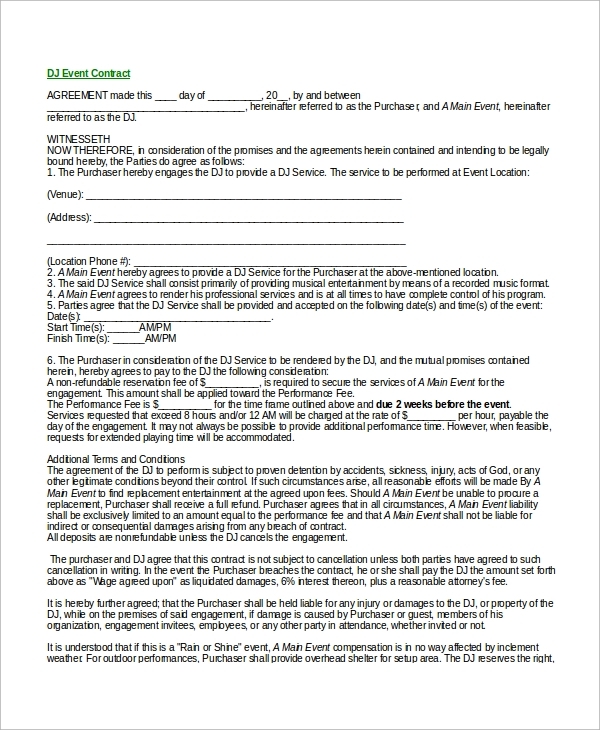 Why are these Contracts Necessary Between the Two Parties? 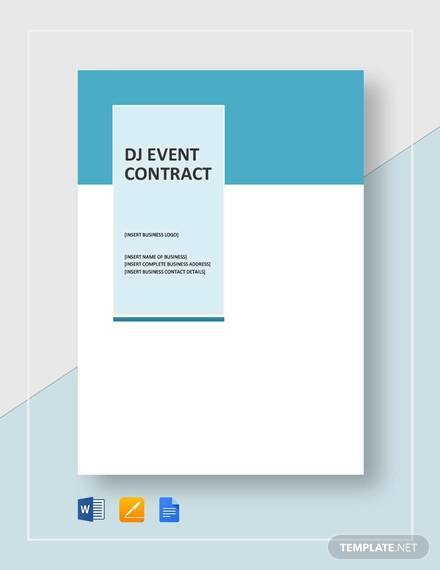 Hiring a Sample DJ Contract is a matter of thousands of bucks. So, when you hire a DJ, you need to specify the exact aspects required by you. Different programs have their ambience, and the choice of songs, usage of lights and other particulars are to be personalized by the organizers. So, it is a professional practice to sign an agreement between the two parties so that each of them becomes aware of the other’s terms. 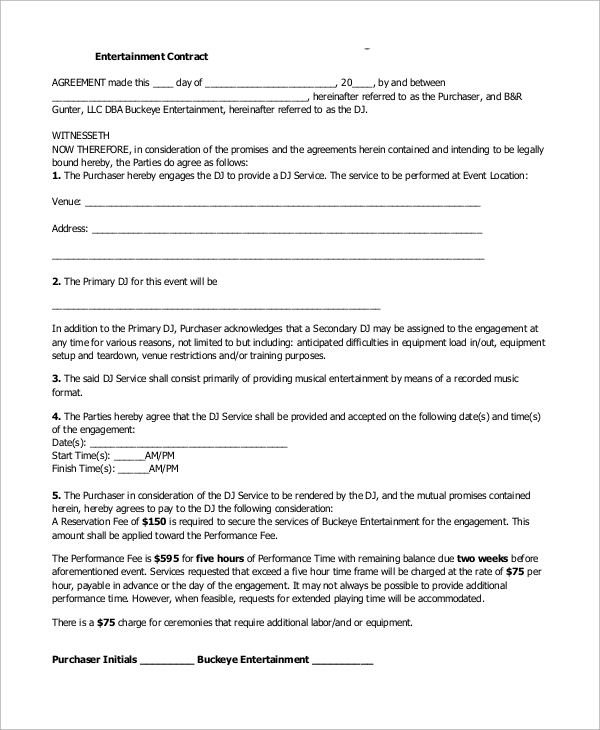 It includes the terms of payment and advance, as claimed by the DJ’s. Sometimes issues arise with the timings and a particular category of songs. To do away with these matters, the agreements are necessary. This contract deals with the managerial aspects of the program. It includes specific information about the number of executives needed, nature of the audience, their preferences and so on. This template starts with the logo and name of the service provider. 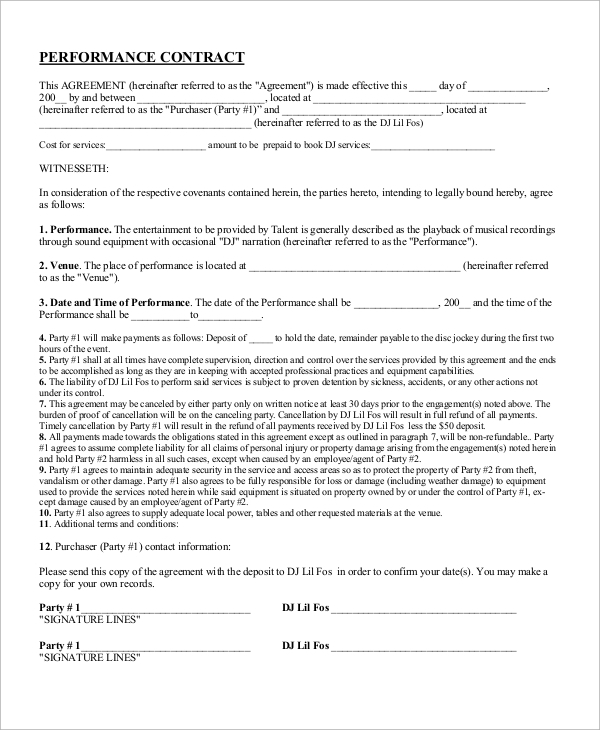 Then different aspects of the agreement, like payment, date, venue, specifications and other terms and conditions of the agreement are included in the template. How to Design these Agreement Samples? 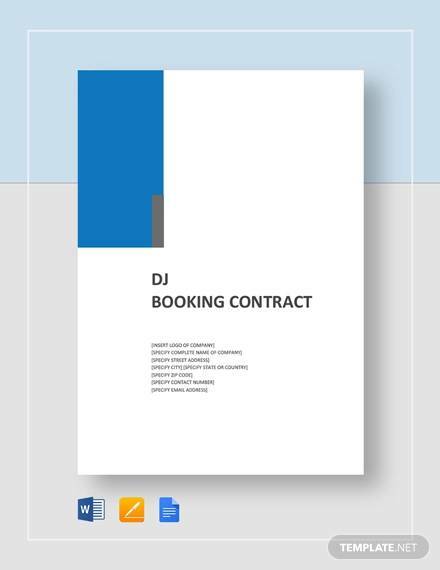 These Agreement Samples are to be designed in such a manner that the interests of both the DJ’s and the other party are recognized. You may ask for an exclusive track to be played more than once, or recommend a particular series of songs, as per your taste. 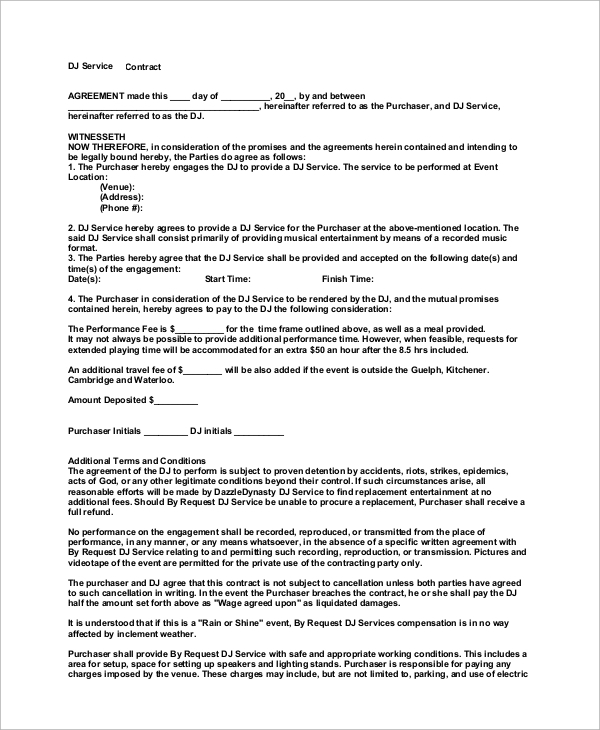 Include the date of the agreement and the names of both the parties at the top. Next, you need to specify the address and timings of the event. Other relevant information about the timings, expected number of guests and technical support are defined in the agreement. Additional terms and conditions form another section of the agreement. What Information Should you Include in the Samples? First of all, you need to mention the names of the two parties signing the agreement along with the specific date. 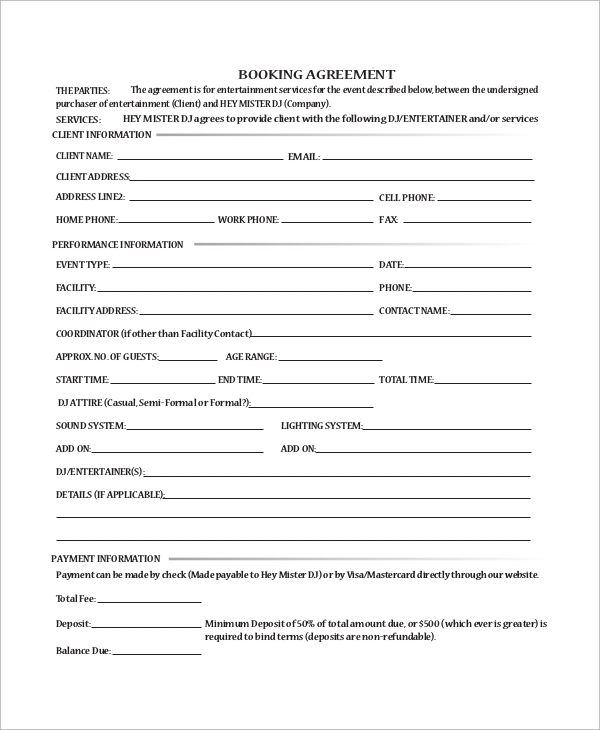 Then the booking information is specified in the document, along with the terms of payment and advance. In a separate section, you need to mention the name and venue of the event. This section includes the address of the venue and the timing of the event. The total estimated number of visitors are also listed in the template. You can mention your special requirements if any in the document. This section is followed by the other terms and conditions of the agreement. It bears the signature of both the parties in the end. You can also see the Business Contract Samples. 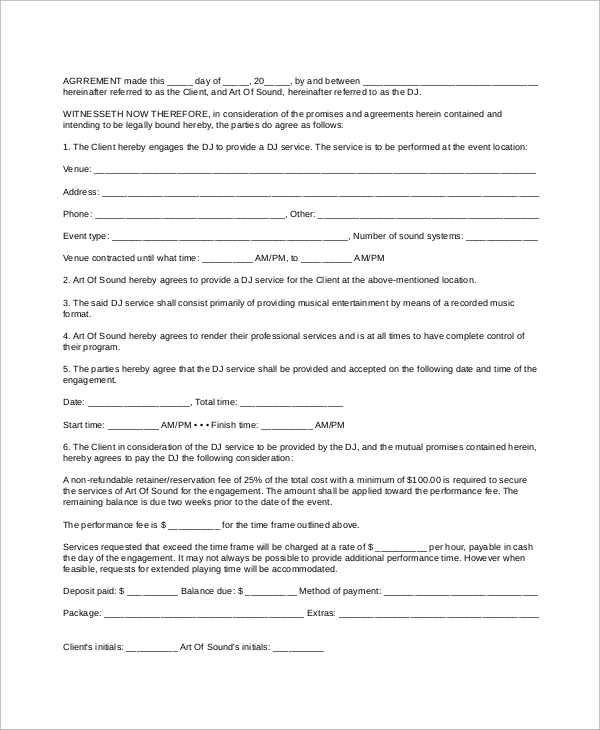 Whenever you arrange for a DJ, make sure that you have specified all your requirements in the agreement form. If you are the service provider, you can download a form from the website and customize it. You may also require Sample Photography Contracts or Sample Business Contracts, which are available on the website.